Fish! I’m sorry for any of you who have fish allergies. I promise that we have plenty of non-fish recipes for you — hit the search bar up in the right-hand corner. I’ve recently discovered the Yankee Fisherman’s Co-operative in Seabrook — I’m pretty sure that the fish comes in the dock off the back and you take it right out the front door. It is FRESH. So when I was there and the flounder looked amazing, I figured I should learn how to cook flounder. Even if he was Ariel’s best friend. Flounder’s a very light-flavored fish, but it’s denser than tilapia, but not as “stiff” as cod. I liked it a lot. Because it’s a thin fillet, I decided to do parchment paper packets and citrus to add some flavor and keep the fish moist. 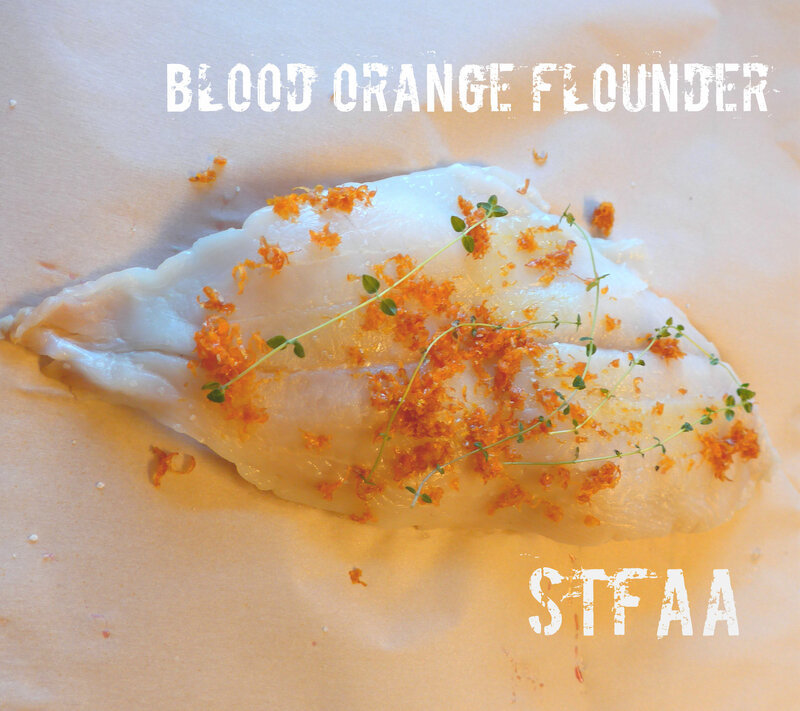 I’ve layered the fish fillets over slices of blood orange, used the zest and some fresh thyme over top. Wrapped in parchment, the fish takes only about 15 minutes to cook to tender perfection. Blood Orange Flounder, pre-baking. Zest and fresh thyme on top, and I swear there are whole orange slices beneath. This light, tender fish is cooked in parchment paper packets with citrus to infuse flavor and prevent drying out. My flounder was two fillets, so I made two separate parchment paper packets. You need sheets that will fit your fillet, longways, with at least 4 inches at either end. Layer 2-3 slices of orange (enough to support most of the fillet), with the fish fillet on top. Then sprinkle zest and fresh thyme over the top of each fillet. Fold the parchment packets. This is what I did -- pull the width-wise edges together and fold over twice. At each end, fold the corners in (like wrapping a present) and fold under at least two times, more if your length allows. Place the packets on a baking sheet. Bake 15 minutes, and then test the fish with a fork to see if it is flaky. 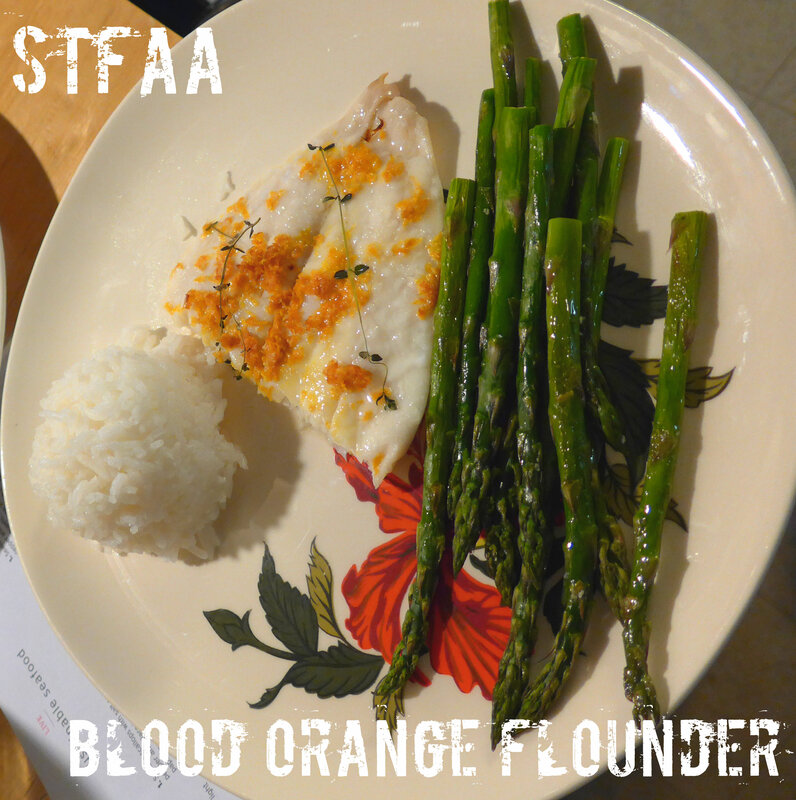 I served this with jasmine rice and asparagus baked at the same time as the fish.